About a year ago, I attended a graduation for an elementary school in which students received recognition and awards for perfect attendance. Granted, the two students who won received bicycles (yah for promoting a health recognition gift versus a Pizza Hut gift card), however I want to address how this simple recognition is incredibly inequitable and potentially harmful to many students. Students who have perfect attendance are more likely to be engaged in school and do well academically- sure! Of course. However, many students can't achieve this for valid reasons. My biggest concern for those with perfect attendance is this... how many students strive for this recognition and refuse to be absent when truly sick? How many students come to school when they legitimately need a day off? How many come to school when contagious? What messages are parents and the school sending when we are rewarding coming to school 100% of days? The message is this: We want you at school no matter what it takes. I understand that it also sends the message that attendance is important, however, there are other ways of doing this without 13% of students who are chronically absent feeling marginalized as a result of a parent issue, health issue, child care issue, homeless issue, addiction issue at home. Rewarding for attendance almost punishes and stigmatizes students who in many cases don't have control over their attendance! Migratory children who qualify as homeless because they are children who are living in similar circumstances listed above. These students are more likely to be chronically absent, as you can imagine. Other criteria that increase risk of chronic absenteeism include: Students who are hungry, living through toxic divorces or have chronic illnesses. Students with unmanaged asthma, for example, are more likely to be absent. If a student does not have health insurance or is from an undocumented family they are less likely to go to a doctor. Students who have vision, hearing and oral health problems that haven't been diagnosed are more likely to be absent as well. If a school is fortunate enough to have a school nurse who implements regular screenings on some of these issues- that does increase attendance rates since these health concerns may be caught and managed. However, nationally, our school nurse situation (ratio of a school nurse to student and even a full time nurse in each school is rare) is pretty depressing. My suggestion is that schools consider spending the resources, time and effort, including collecting the data to inform and determine why students are chronically absent at their school, develop a school-wide strategic plan around it and implement some evidence-based strategies to create equity around attendance and presenteeism. However, consider two things: Don't reward for 100%/Perfect attendance (lower that percent) and do it in a way creates an inclusive environment, not a disparate one. Adolescent Health- Tobacco Prevention Ideas! 1. Work with one district that just adopted a strong comprehensive policy that is ready to go from awareness (policy is there, but only awareness of it exists) to implementation. Content support may include: Systems Thinking Systems Changing Simulation, Tobacco Policy, School/District Wellness Councils, School Health Index completion to drive action planning, review local YRBS data around tobacco, analyze inventory/Index results and prioritize, evidence-based tobacco prevention programs and practices, action planning, implementation of action plans, evaluation and sustainability work. Photos are submitted by a certain date and state convenes a group of experts to judge photos, using a scoring rubric that has been developed and shared as contest rules/process is distributed.Use some dollars to offer prize money to 3 winners. Contest is an opportunity to partner with school related arts, school health and state and local tobacco prevention partners. It’s also an opportunity to do some advocacy for tobacco prevention. An evening event may be held where top 10 photos are displayed and invite partners, youth, etc. -Develop effective media messages for their communities. Analyze and assess all tobacco policies from all districts in State/region and score them using a rubric based in best practice. Create a statewide map with a key marking districts as gold, silver and bronze. Bring that map to training events and administrator and school board conferences and share via social media. 4. Offer Tobacco Prevention Curricula Training events to two districts that apply. Application will include a readiness checklist. Trainer facilitates a one day training on Foundations of Health Education and participants will use CDCs HECAT to select an evidence based or promising practice tobacco curriculum that best fits their district’s needs. Trainer supports district presentation to their school board for adoption of this curriculum, if applicable. Once adopted, a 2-day tobacco prevention curriculum training on the program selected will cover the following goals and objectives. 5. 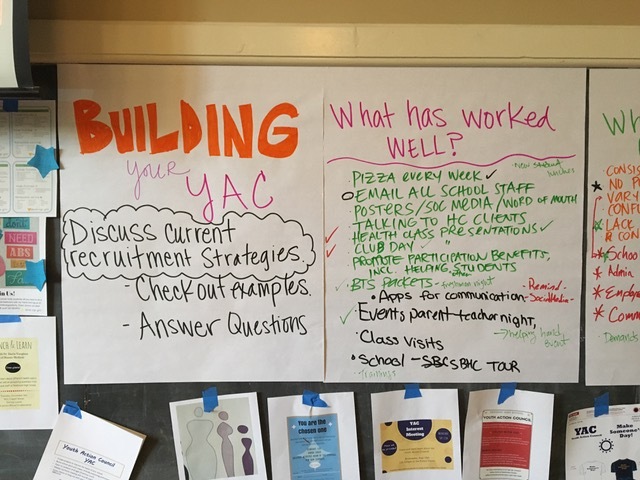 Host a full-day Systems Thinking Systems Changing™ simulation training with youth (middle and high school-aged) and policy makers/education leaders. Systems Thinking/Systems Changing™ is used by teams in workshop settings to experience what it takes to make effective systemic change in schools. It provides opportunities for youth, educators, school boards and councils, leadership teams, school administrators, educational consultants and reformers about the structures and strategies that schools need to be continuously improving learning organizations that are the best they can be. It supports doing systems change in schools, including policy creation, revision and implementation. 6. Facilitate positive youth development action research project around Tobacco Prevention. Includes 3 non-consecutive full day workshops.